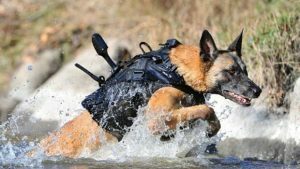 Thomas Calabrese — Nick Lannigan took a roundabout way to becoming a military dog handler and one that he never envisioned when he graduated from Escondido High School in 2010. He joined the Navy with the specific goal of becoming a SEAL. After completing his training, he was assigned to Team 2 under the command of Naval Special Warfare Group Two based in Little Creek, Virginia. Their primary focus was the Atlantic region, South America and Europe. After three years with the team, tragedy struck when Nick’s parents were involved in a serious car accident near the Las Pulgas exit on Interstate Five, north of Oceanside, Ca. They were driving in the third lane 50 yards behind a tractor trailer truck that was in the far right one when it blew a front tire and quickly jackknifed directly into their path. Unable to swerve out of the way or brake, Alex Lannigan crashed into the trailer and the car rolled over several times. His father died at the site and his mother was seriously injured. After several emergency surgeries and thirty days at Tri- City Medical Center, Stacy Lannigan was transferred to a long term medical facility to continue her recovery. “I offered you that option when the accident happened, but you said that you could handle it,” Captain Sandoval reminded Nick. “Thank you Captain, Nick responded. Two weeks later Nick was transferred to Coronado and assigned as an instructor so he would not be deployed. Six months after his return, his mother passed away and Nick felt that it was as much from a broken heart as it was from the complications caused by her injuries. He wasn’t raised to be a victim so he thought the best way to honor the memory of his parents was by re-dedicating himself to his mission. “I’m ready to return to full duty.” Nick said. “You don’t have to rush it, take all the time you need,” Commander Harding offered. “You got it,” Commander Harding said. Nick was assigned to Seal Team Five and had completed five missions when his platoon was sent to Marine Corps Air Ground Combat Center, Twentynine Palms to practice HALO (high altitude low opening) parachute jumps in preparation for a mission in the Philippines. The base was located in the Morongo Basin of the High Desert region of the Mojave Desert in Southern California and is the largest United States Marine Corps base. On this particular exercise, Nick and his fellow Navy Seals would exit the plane at 30,000 feet with oxygen. HALO jumps are extremely dangerous. At high altitudes (greater than 22,000 feet) the partial pressure of oxygen in the Earth’s atmosphere is low and lack of pressure can lead to hypoxia. A typical HALO exercise requires a pre-breathing period (30-45 minutes) prior to the jump. Nick and his team were sitting in the hangar breathing 100% oxygen to flush nitrogen from their bloodstream. After the SEALS completed this, they put on polypropylene knit undergarments to prevent frostbite. The temperature that they would be jumping at could be as much as minus 50 below zero. Buck, the platoon combat dog would not be making the practice jump so there was no reason for him to practice since he was going to be tethered to his handler, Chief Petty Officer Hutchinson during the mission jump. Everything went according to plan and the SEALS fell over 28,000 feet before opening their chutes when their altimeter indicated 1800 feet. Another additional risk with a low altitude opening is that if the parachute fails to deploy or the lines become entangled, there is less time to resort to the reserve or correct the malfunction. Nick had over a thousand jumps and did not panic when several of his lines got twisted. He straightened them out and got a full canopy by the time he had dropped to 600 feet. By now he had little time to make a course correction and instead of hitting the designated landing zone, he landed 800 yards due east of it in the middle of some large boulders and twisted his right knee on landing. When he got back to his quarters, he put ice on his knee and elevated his leg. He thought he would be alright by the next morning, but instead it was swollen to twice its size. The reasonable thing to do would have been for Nick to pull himself off the mission, but instead he popped four over the counter Advil pain killers, slipped an elastic brace over his knee and told no one. Abu Sayyaf was a radical Islamic extremist group and on July 23, 2014, leader Isnilion Hapilon swore an oath of loyalty to Abu Bakr al-Baghdadi, the leader of Isis and the group began kidnapping people for ransom. Their recent victims were a group of Christian missionaries and they were asking $5,000,000 for their safe return. “I know,” Lieutenant Baxter sighed. Just before he left, Lieutenant Baxter gave Nick some extra ammunition and grenades and the Navy SEALS made their way down the trail with the hostages. Nick found a level place to lie down and set eight grenades on the ground next to him. He knew what would happen to him if he was captured so he was saving the last grenade for himself. As the enemy fighters came into view, Nick shot four of them and threw a grenade as far as he could. For 30 minutes he kept the terrorists pinned down with well-placed shots, but he was running out of ammunition. He had also been wounded twice, once in the upper left arm and once in the right shoulder and could barely hold his weapon steady as he continued losing blood. If there was any good news about the dire situation, it was that the bullet wounds took his mind off the pain in his knee. The enemy fighters were moving closer to his position so Nick pulled the pin on the last grenade and held it in his hand and waited for them. Suddenly he heard gunfire coming from up the trail and saw his team coming back for him. He put the pin back in the grenade and lapsed into unconsciousness. “If you would have gotten yourself zapped, it would have been the Congressional Medal of Honor,” Senior Chief Larabee joked. “Yeah, the last that I heard he was training dogs? “Sounds like pretty easy duty,” Nick responded. “Easy, but very important. The other reason I’m sending you to Pendleton is that there’s a physical therapist at the Wounded Warrior complex whose had surprisingly good success bringing injured warriors back to functionality…I guess that’s the right word. I called and told him about you and he’ll be expecting your call,” Commander Harding explained. Nick never served with Rick Bergeron, but a former Navy SEAL and a current one was still a very strong bond. Once he got to the facility in the most isolated area of Camp Pendleton, Nick wasn’t going to just sit around and watch so he started gradually taking on as much as his injuries would allow. While on a mission in Afghanistan, Nick’s former team lost two men during a fierce firefight with the Taliban. Chief Petty Officer Hutchinson, the dog handler was one of the fatalities and after his death, Buck went into a severe depression. It was hoped that maybe the combat dog could be re-trained or adopted so he was sent to Rick Bergeron’s facility for evaluation. The last option was that the animal be put down. Buck picked up his head and laid it on Nick’s lap. This was his way of telling the Navy Seal that he understood and was finally ready to move on. From that day forward, Nick and Buck were inseparable as both man and animal shared the same goal of getting back to full duty. Over the next eighteen months, Nick and Buck deployed three times and went on numerous patrols. They were more than just handler and dog, there was a bond between them that was unbreakable. During their last deployment in Afghanistan Intel reported that Muhamned Omar Fazlullah, an infamous bombmaker, responsible for a string of terrorist attacks throughout Europe was in the area. Bravo Team was sent out to connect with community elders to find out if they knew anything. Nick and Buck assumed their customary patrol position—walking in front of the others to clear the road ahead and every team member knew that Buck would keep them safe. They entered a grape field and were a little more than a mile outside the outpost when Nick noticed changes in Buck’s behavior, his ears perked up, his tail stiffened and his sniffing of the ground intensified. He was sure that his canine partner had picked up the odor of an IED so he signaled the team to hold their positions. A few seconds later they came under attack from several positions as the Taliban fighters directed their fire at the main column. Nick heard whistling sounds, high and fast, flying past him from two different directions and recognized it as light anti-tank rockets. The Navy Seals were caught in a deadly crossfire and they were hugging the ground as they tried to figure out which way to go. In the confusion of battle Nick and Buck slipped away without being noticed. Nick got behind the first rocket position, opened fire and killed all six fighters. The second rocket position was on the other side of the field and would require Nick to run through open terrain to reach it. “This is what they pay us for,” Nick patted Buck’s head and they took off at a full sprint, zigzagging along the way with bullets nipping at their heels. They had almost made it completely across when machine gun fire gravely wounded both of them. They had just enough strength to jump into the second rocket launching’s position where Nick shot four men and Buck killed the last fighter by severing his carotid artery with a well-placed bite. Buck crawled over to where Nick had fallen to the ground and rested his head next to his. “What do you mean, no dogs,” Nick protested. “We’ve got a place for them. You’ll be so busy you won’t even think about him,” The woman promised. As Nick looked in, several women walked by carrying full plates of foods. They were so close that Nick smelled the tantalizing aroma and wanted to reach out and grab some. His stomach rumbled for nourishment, but Nick fought the temptation and kept his hands by his side. “What is down this road?” Nick asked. “Nothing good,” The women warned. “You’re sure you won’t let my dog in?” Nick asked. “We have our rules and there are no exceptions,” The woman answered. While walking over rocky terrain, Buck began limping and despite his weakened state, Nick did not hesitate to reach down and pick up his beloved canine friend and begin carrying him. This time when he came over the ridge and saw another oasis, a breathtakingly beautiful blonde woman with expressive blue eyes was standing in front of a gate with a warm smile, “Welcome Nick…we’ve been expecting you.” She placed a bowl of water on the ground for Buck and gave Nick a full glass; amazingly the first sip instantaneously quenched their burning thirst. “Why is that?” Nick asked. “Dogs cannot get into hell because they represent the purest example of unconditional love. They would just destroy the ambiance of fire, brimstone and hate that is the Devil’s brand,” The woman explained. I enjoy reading your stories on a Sunday morning! Good dog story. Most enjoyable. Another great story Tom, and you got to get your love of dogs into the story. Terrific Story, a Navy Seal and man’s best friend a Canine with a little humor inserted int o the story. Very nice and a very nice read for all. “Remember-yesterday was the only easy day! Copy that!” Wow!!! Thank you for the story this morning. These Soldier & K-9 teams are remarkable. Fascinating to think about a HALO jump with an animal – wow again. We are blessed to know man’s best friend personally in our lives. Keep them coming. I enjoyed the story…good job. All dogs should go to heaven…they deserve it for all they give to us. I enjoyed it. I liked the details about HALO. I guess god has an odd sense of humor about getting into heaven . You could have lived a good honorable life but then at the end you have to choose the right path to get the prize of heaven. Kind of like the Price is Right. Our dogs are our best friends! What a great story of love and honor. I enjoyed it a lot! An action story with some sci-fi spiritual thrown in. Buck is my kind of dog.